The large, eastern Sicilian port city of Messina has been struggling to salvage its reputation ever since being panned in the late 1700's by highly regarded Goethe, the famous German writer and scientist often quoted on European public plaques. Goethe visited 4 years after Messina's devastating earthquake of 1783 and didn't give it much slack for being in shambles. 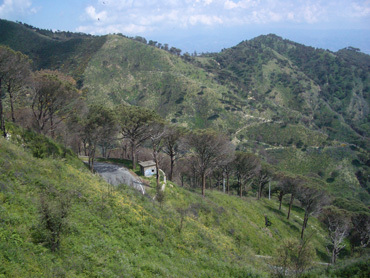 Instead, his accolades went to nearby hilltop Taormina and its dramatic Greek theatre. The steep hills above Messina that we rode through twice. The 1908 earthquake killed half of Messina's population of 160,000, creating another set-back. It suffered equally bad press by critics of the day for the choice of a new architectural style used in reconstructing the city after that quake, which was labeled as "devoid of value." But time helped salvage a bit of its dignity as the much maligned, more modern urban design later became known as Art Nouveau. WWII brought long-suffering Messina yet another opportunity to redeem itself with a fresh start as it was extensively bombed by the Allies. But despite the second 20th century rebuilding opportunity, our Michelin Green Guide didn't enhance Messina's stature as the guide rated it a "no star" city. Our Lonely Planet echoed the same theme: though it described some of the sights to be seen, it labeled Messina as "not a tourist city." We'd read the lack-luster reviews accumulated over several centuries and decided that Messina was a perfect match for our needs and there we parked ourselves for 5 nights. . The entrance to Messina's harbor & The Straits. 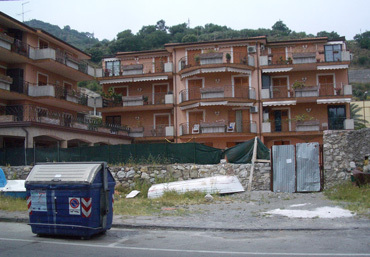 We were bumping up against the 3+ day Liberation Day holiday weekend and needed to vacate the more scenic but too-popular Aeolian Islands, beach areas, and tourist towns to find lodging. Messina read like a place nobody would want to be, reducing the competition for space and, as it turned out, the prices. In addition to the pressure the holiday created on lodging availability in the region, the sale of our house was approaching a critical juncture, so we arrived in Messina a couple of nights before the holiday to guarantee timely replies to our realtor via high-speed internet, using both email and internet phone. Low expectations no doubt helped, but we had a lovely stay in Messina. Our very dated but bright and spacious room met our needs and the central location made it easy to see what there was to see. We leisurely enjoyed 2 walking-about-town days and 2 biking days to local landmarks. Though the city was founded in the 8th century bce by a pirate, little of Messina's 8th and 5th century bce Greek colonist history shows, nor does its later Roman heritage. 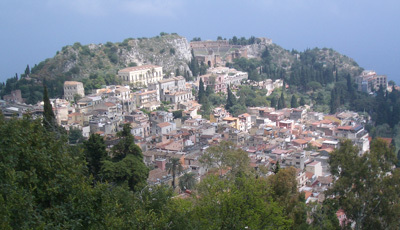 Unlike more scenic Taormina, Messina's real estate was too sought after so it was intensively modified and heavily used by each round of invaders. Only bits and pieces from the region's usual string of later conquerors, the Arabs and the Normans, remain today. 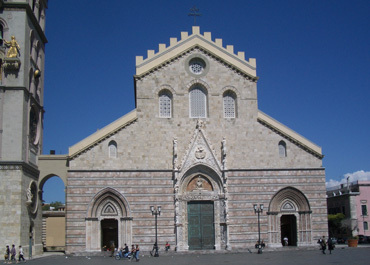 Messina's cherished Norman-styled, 12th c Duomo. 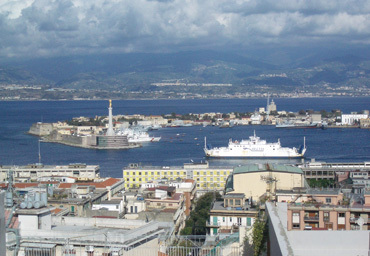 Messina's enduring importance has been its harbor and its position on the Straits of Messina, with the locals claiming their natural harbor to be among one of the most welcoming in the Mediterranean. That all of course translates into "much fought over." At the very narrowest point, The Straits are less than 2 miles wide, straits that form the narrowest of barriers between continental Europe and Sicily. The modern day commercial thoroughfare with Reggio Calabria on the mainland is a little wider, but not much. The people of Messina have always turned to their harbor for their identity and rallied and rallied again with each disaster to reconstruct the enveloping city with a sense of style and history. Messina is primarily a modern city but the efforts to faithfully reconstruct buildings like the 12th century Duomo and embellish it with early 20th century clock works have given it focal points. Some historical buildings have been repaired, others recreated, and still others built anew in a historical style. Luscious strawberries by the flat. The modern pedestrian promenade, which shares the harbor area with commercial activities, as well as other tree-lined promenades added to the ease of being in Messina. It was along this harbor area where we visited with some of the English-speakers on the 2 huge cruise ships in town--one of which was carrying 2,000 passengers. 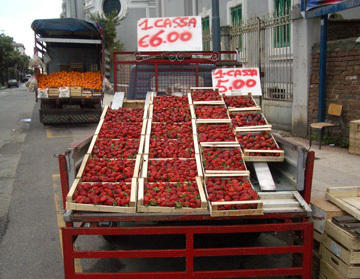 And despite the mass exodus of locals from the city on the holiday weekend, I nabbed our first big batch of strawberries for the season in Messina. You can take a short tour of Messina's more eye-catching architectural details by clicking on Photo Gallery on the Homepage and then Messina Architecture. According to the local tourist information, Taormina at the eastern end of Sicily is the most celebrated tourist spot on the entire island. It was founded relatively late, in 358 bce, by Greek colonists already in the area. Like other cities in Sicily, Taormina was conquered by the Muslims in the early 900's and reclaimed by the Norman Christians a few centuries later, each of which left their marks in its architectural legacy. The view part way up to Taormina. Travelers, like Goethe of the 18th century, discovered the drama of Taormina's craggy setting and somehow the suppression of religious guilds in 1866 influenced the growth of accommodations for tourists (exactly how this happened got lost in the translation of our Messina brochure.) Two years later a Prussian baron was inspired to visit based on Goethe's earlier writings and his painted portrayals of Taormina were exhibited in Paris. That pictorial representation of Taormina immediately catapulted it onto the 19th century equivalent of the French and Prussian jet-set circuit. 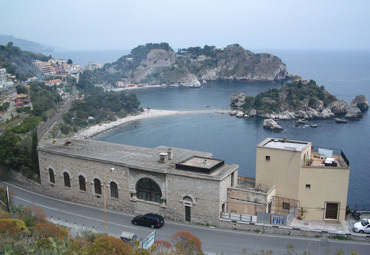 The subsequent cholera outbreak of 1875 had Palermo's nobility taking refuge in Taormina and their villa building-spree was added to those of the international visiting elite. About the same time, another German baron took photos of Taormina that expanded its reputation to include being the site of a mythical Greek civilization. The commanding position of its Hellenistic-era Greek theatre helped support his fantasy. The theatre is universally referred to as Greek, though the extensive renovations done centuries later by the Romans left little of the Greek contribution visible, other than the site selection. 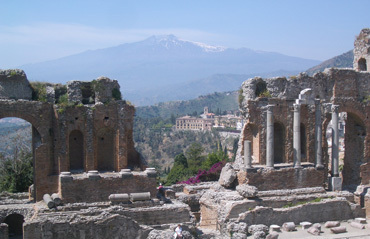 Hilltop Taormina with its Greek theatre in the background. We found Taormina's long established, rip-roaring tourist trade to be its most compelling trait. Somewhat isolated from tourists for most of our 6 weeks in Sicily, we were spellbound by the spectacle. Packs of tourists were on the move in and out of the shuttle buses and up and down the streets. We stared and stared some more at the delighted throngs. Mobs of Italian school children in matching baseball caps and organized groups of adult tourists speaking Italian, German, and French filled out the pack. The Slavic speakers were here, as well as the equally less-often-seen-in-Sicily Asian tourists. We mingled with the crowds to immerse ourselves in the spectacle that we contributed to and we stood back on high places to watch it from a far. Despite the sometimes chilling wind, ice cream sales were brisk. Being in Taormina at the very beginning of tourist season hit us like going to Las Vegas for the first time and we couldn't believe our eyes. 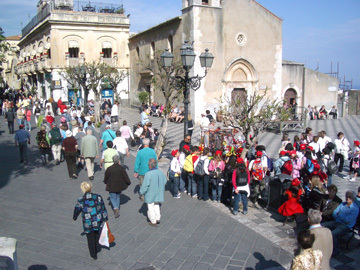 Throngs of tourists in the open spaces of Taormina. We'd taken our first tour through Taormina's lovely old town streets the afternoon we arrived and soon realized we hadn't seen much of the town itself. We'd felt the buzz created by all of the eager visitors and seen the commercial overlay of boutiques and ice cream shops, but we hadn't seen what had originally put Taormina on the tourist circuit. But we'd enjoyed our double-barreled dose of its most modern aspect and retreated to our more remotely perched B&B room content to look deeper for the real Taormina the next day. But we didn't have much success in seeing the real Taormina the next day either. We thought back to the drama of Taormina's steep hillside setting that had been so potent for us as we navigated the narrow switchback road on our bikes, often being passed by horn-beeping buses. We had frequently pulled off the road to simultaneous catch our breath and to take in the changing views of the shoreline below us. But once actually in town, the natural drama of Taormina was harder to catch sight of the 2 days we tried. Mt Etna made a noble backdrop for the Greek theatre. Looking down the steep slopes one could rarely see all of the cascading hillside below as the many perched buildings blocked much of the experience of the topography. And the tight twists and turns in the terrain made it hard to see where one was in relation to slopes, though there were many grand panoramas off in the distance, including hazy Mt Etna. And as we tried hard to peer past the modern jumble to the heart and soul of Taormina, we couldn't spot it, even when the streets were quieter. We decided we'd have to imagine modern Taormina with the look of other, less disturbed Sicilian villages we'd seen to understand how the tourism momentum began more than a century ago. Willing or not, Taormina had been reinvented and that was all that was now before us. Mt Etna wasn't on my very short "must see" list of Europe but once we arrived in Sicily, it popped on. To be so close, to have seen so many things of which I'd never heard, and then not go Mt Etna would be all wrong. At 3,340 m or almost 11,000', Mt Etna is Europe's tallest volcano and we expected it to pack a punch. Map Man obliged and after Taormina, we made a beeline to Etna, which we'd been able to see from the famous Greek theatre. Even closer, Mt Etna was still hazy & indistinct. But it was hard to be thrilled by seeing Etna, even as we extended our visit by looping 3/4's of the way around her very broad base. She was always indistinct behind a veil of .... what was it? Clouds we were told, but it didn't look like clouds. Dust from North African Sirocco winds, high humidity, smog--whatever the source of the haze, it diluted her grandeur. The amount of visible snow was greater on the north side and the views changed a bit, but the scattered poppies, bright yellow gorse blooms, and the increasing amount of roadside litter were better at drawing our attention than the wheezing volcano whose origins can be traced back 600,000 years. An unexpected bonus from our 4 day loop around Mt Etna was a curbside conversation with an animated young Sicilian man--a conversation that lasted for another hour after I charged through the door he opened with a passing mention of the mafia. At age 27, having studied both in the States and in Northern Europe, he was hopping mad about the mafia. His girlfriend, who understood most of the English conversation but preferred to speak in Italian, was very uneasy with his opinions. But he had clearly drawn the same conclusion as we had: that his girlfriend's greater hopelessness and compliance with the mafia was because she hadn't been away from it. In addition to the greater mobility that the formation of the EU was allowing, such as with his studies, he felt that the growing use of the internet and the "Protestant perspective" gained by the European satellite TV system "Sky" were also prompting more Sicilians to question their complicity with the mafia. In contrast to what an older American man who annually works the fields with his Sicilian relatives had said, the mafia isn't mostly a western Sicilian problem, but the grip varies from town to town and area to area across the island. The young man said that in the poorer neighborhoods of the urban area of eastern coastal city of Catania, the going rate for a promise to vote for a specified pro-mafia candidate was 50€, about $75 with the current weak dollar. That tidbit underscored his belief that the 'modern mafia' is all about politics and control and that it was moving away from overt violence. For his privacy, I'll keep his city anonymous, but his was a town tightly held by the mafia. I've read several references to the "state within a state" model of the relationship of the mafia to the elected government, but he added a third player, the Vatican. Having been abroad had alienated him from the Vatican and had crystallized its position in the power sharing in his mind. 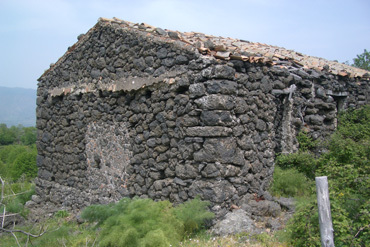 He commented that an old church in the town of Belpasso (on our Mt Etna loop) was able to hire restorers from northern Italy only because it was a church project and came under the power sphere of the Vatican. No other project in the city would be allowed to hire non-regional workers because of the mafia control over the public sector spending and public sector jobs. Young people who wanted to advance in their professions because of their qualifications had to leave Sicily, he added. The same covert power network that controls the hiring for public works projects also controls job placement. He was ashamed to have tapped into the power network in order to get his current job and yet his father shrugged it off as "It's the only way." The girlfriend was very, very pessimistic in response to my question as to how Sicilians will rid themselves of the mafia. She was convinced that the root of the problem was a state of mind that contaminates them all and that it can't be eradicated. Her only remedy would be to 'dispose' of all the Italians on the land and replace them with French, Spanish, Germans, or other Europeans. She wasn't at all apologetic about restricting Muslims from repopulating Italy for the anti-mafia purge as she said their culture was too different. intentional mafia public works neglect or just coincidence? The couple argued a bit about the 'eradicating the mafia' issue in Italian and he was clearly in the "it is possible to change" camp. He said that a group of 15 had formed an independent newspaper in Belpasso, where the church restoration work was being done, and they were working to expose the dual power system. "Yes, it was dangerous for the reporters" he said when I asked, but their efforts were already achieving greater accountability in the local council meetings. The reporters had originally been banned from taking photos at the meetings but the self-appointed journalists finally prevailed in taking photos for their paper by pressing for their legal rights. I was surprised by the new details he provided about the boundaries around mafia activity in eastern Sicily. It's his opinion that the mafia only affects the public life: the public sector, universities, and businesses. When I asked if the German and other tourists buying homes in Sicily would get a knock on the door to pay 'fees' to the mafia, he said not. Private individuals just living their lives weren't bothered for protection money--Sicilian or not. He said that not all businesses had to pay, though he didn't know which ones. I expressed surprise at his lack of knowledge about the 'rules', stating I assumed that was something he just knew as he grew up. "No" was his response as he said he never wanted to know. However he did consider that knowledge as to who pays and who doesn't to be a part of the wisdom of aging in Sicily. He added that by the time he was in his early 40's he assumed that he'd know which businesses were exempt from mafia extortion, which paid dearly, and which were in the gray area. In the conversations between the young couple, they made a distinction between criminals and the mafia. Our best guess was that even the new mafia conformed to a greater code of honor than independent criminals. Also, criminality outside of the mafia didn't exist when the mafia was stronger and more centralized. In his mind, the mafia was now decentralized into clusters of small clans without a strong central figure and that left more room for other criminals. Perhaps the protection money doesn't buy as much protection as it did in the past. We ate our much-delayed lunch in a small park after the curbside conversation with the young Sicilians and our attention again turned to the mountain we were touring around. I thought that if Mt Etna were auditioning for a part as a mountain or volcano, the casting director would have quickly said "Next!" as Mt Etna is a homely thing. Rather than a dramatic, bold, upright mountain she is instead a massive bulge too broad at the hips. Never in the 10 days she was in our view did she demonstrate any pizzazz, never did she dazzle. Instead, every time we looked her way she coyly veiled herself in a haze--until a glimpse I got between downpours on our very last day in the area. 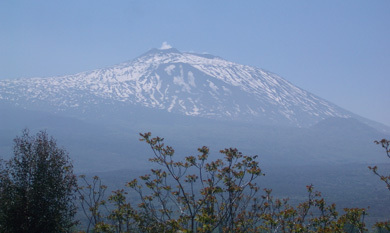 Mt Etna's lava, rather than her image, had a stronger presence. We tried hard to fall in love with Etna as our B&B host/cyclist in a nearby town had done. We slowly biked about 3/4's of the way around her base, staying at 4 different Etna district towns. We tried the high road with more traffic and then the low road with few trucks, but it didn't change our impression. We saw her more snowy side north side and her less snowy south side. Morning, noon time, afternoon, and dusk--the changing light didn't help. Mt Etna was always a bit shapeless, far-off, and in a haze. Even when we made our way up her surfaces by bus, cable car, jeep, and then foot, she failed to dazzle. It was like we couldn't ever really see Etna; there was nothing that made us go "Wow!" After decades of seeing our home grown volcanoes, Mt St Helens and Mt Hood, and knowing that they could still pack a punch, we were disappointed. The Matterhorn, the Dolomites, and other non-volcanic mountains in Europe could make us "ooo and haaa" but Mt Etna just couldn't. Yes, it was interesting to tromp around on her varying surfaces of lava and gritty explosive bits (some only a year old), but we couldn't see the forest for the trees. Even when we were 150' from her tippy top, we couldn't tell. Emitted gases and passing clouds prevented the final ascent to the highest point, but I doubt it would have looked any more grand if we could. A visit to our Photo Gallery Mt. Etna will let you see what we saw. Several friends emailed us about Mt Etna's latest big eruption while we were in the area, but even that was unseen by us. We slowly biked south out of Mt Etna's range, never having fully felt her presence. 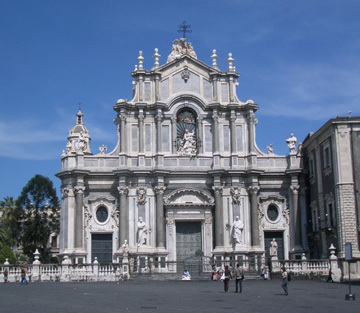 Catania's pride & joy: the Baroque Duomo. Both cities had several opportunities in the last few centuries to rebuild and in our minds Messina had done a better job of making a fresh start. Messina was a much better walking town than Catania which is decidedly unpedestrian friendly. Despite Catania's UNESCO listing as being one of the eastern Sicilian towns to retain its Baroque features after one of the bigger volcanic devastations, we didn't find it to be charming. Like Messina, my camera did find some delightful architectural details to capture and the lava-faced baroque Duomo or cathedral makes a splash, along with their logo Roman elephant, and other decorative buildings in the same square. 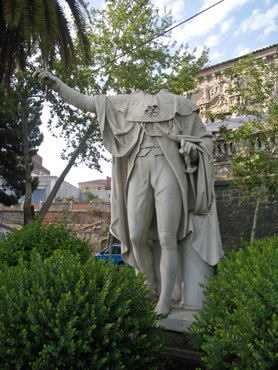 But it was the several startling headless statues around town that exemplified the mildly disturbing quality of being in Catania. 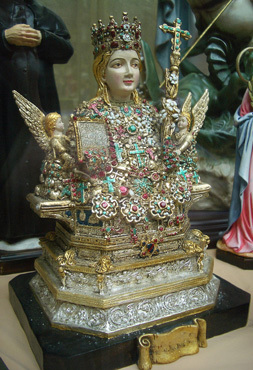 Catania's much portrayed patron saint, St Agata, had her breasts slashed off in the process of her martyrdom, adding more squirmy impressions of the city. Maybe the mafia mischief didn't look so bad to the locals compared with other violence in their history. Unsettling, just like Catania itself. The row of derelict "headless" buildings just blocks from the Duomo reminded us of Palermo and had us wondering if their persistence was somehow the product of organized crime. Was the local mafia siphoning off the money designated to tend to these areas or perhaps their crumbly facades made convenient fronts for nefarious operations? We were especially puzzled by one of the neatly swept little streets between a pair of crumbling buildings that had a "No Pedestrians" sign on it and yet there was an older man in a bathrobe seemingly stationed in a plastic chair with a cell phone part way down the street. Another man was out and about farther on, making it look like an inhabited area. This little street and the adjacent ones were pristinely kept as no garbage was collecting around the edges as was around the more modern buildings across the street. The dark side of organized crime provided ready stories for the odd combination of observations and yet we felt it foolish to press for answers. Perhaps it was just a dead end street and yet we hadn't seen another other such "No Pedestrians" signs in our accumulated hours of exploring Catania. Aside from being a little spooked from possibly stumbling onto a mafia "no-go" zone in Catania, our most memorable activities were lingering at the daily fish market and visiting the "Sbarco Museum" of the 1944 Allied landing in Sicily. The museum was a bit difficult to get to on foot and was so extensive that it took many hours to see, whereas the fish market was an easy-to-access eye full that didn't require much effort. The Sbarco Museum was another in a string of "No Photos" places, but you can take a thorough visual journey through the Catania Fish Market by visiting our "Photo Gallery". We also industriously visited the very ruinous Roman ruins scattered around the city, though that process did more to punctuate our indifference to Catania than heighten our fascination of all things Roman. We continued south from Catania along Sicily's eastern coast. Bill's previous plan of leaving Sicily from Messina to head for another Italian island, Sardinia, had been abandoned because of miserable ferry connections. Instead, he'd proposed on closing our loop around Sicily and at Catania that still looked like a good plan. At Catania we set our sights on visiting some of the island's hottest tourist destinations, Siracusa and Agrigento. That would then line us up well to cut inland across some familiar territory to make our way to the more accommodating port of Palermo. We've been meandering through the Spanish and French Pyrenees in a generally westward line for almost a month now, pedaling up the passes and checking-out the hiking on layover days. We dropped thousands of feet into the river valley city of Pau to escape the chaos of the Tour de France a couple of days ago. Ironically, Pau is where many of the teams were lodging during their various assaults on the summits but the city is big enough for all of us. Tomorrow the pro's leave the mountains for other challenges and we'll hit the road too. We'll grind our way back up to higher elevations again to spend another 1-2 weeks in the peaks. After that, Map Man will have to connect the dots so that we appear in the Dolomites of northeastern Italy in a little over a month.